Being part of an established cultural institution is exhilarating and challenging all at the same time. You know you have so much to offer, but staying relevant and communicating your value is a job that never stops. In this episode, we explore one such place, the George Eastman Museum in Rochester, New York. Eastman was a larger than life figure who left a lasting legacy especially in the world of photography and film. But of course, there is so much more to him and to the museum that bears his name. For our conversation, we have two guests joining us: Eliza Kozlowski and Stacey Vandenburgh. Eliza is Director of Marketing and Engagement. She has worked at the museum since 1990. She oversees communications and marketing activities, publications, digital engagement, guest services, exhibitions, and programs. Eliza is a member of the board of the American Alliance of Museums and is past chair and current board member of the Public Relations and Marketing Professional Network of the American Alliance of Museums. She is a board member of the Museum Association of New York and past board member of the National Susan B. Anthony Museum and house. Eliza is an active member of the Visit Rochester and is past a president of its active volunteer arm, the Visitor Industry Council. She is a past recipient of the “I Love New York Award” for cultural tourism promotion. Stacey is the Guest Services Manager at the George Eastman Museum. In this role, she schedules group tours, manages staff at the Lipson Welcome Center, assigns mansion, gallery and garden tours to 50 docent volunteers and oversees the museum’s photography workshop program. Stacey graduated from Smith College in Northampton, Massachusetts with a BA in Art History. She also holds an MFA from the School for American Crafts at the Rochester Institute of Technology in Woodworking & Furniture Design. She has worked at the museum since 1996. Before this role, she was the manager of the KR Whitmore Conservation Center and served as Assistant Registrar. She also worked for the Metropolitan Museum of Art in New York as Conservation Technician in the Department of Objects Conservation. Stacey is active with Rochester’s CVB, Visit Rochester. She is currently the chair of the Group Tour and Travel Trade Sales Committee, a program of Visit Rochester’s Visitor Industry Council. The committee presents Greater Rochester as a preferred destination and stop-over in the travel trade and group tour programs. Members work collaboratively on sales missions, presentations, trade show exhibitions, education and overall market development. I’m looking forward to learning more about those collaborations. Thank you both for joining me today. Eliza: Thanks for having us. You both have very impressive backgrounds. But there is always more to the story, right? I’m wondering if we could start with you, Eliza. Can you tell us a little bit more about your journey and how you got to where you are today? Eliza: Oh sure. I am originally from Washington, DC but I went to school up in St. Lawrence University, so that was my first introduction to New York. I never thought that I would live in New York, but chose to move to Rochester, followed some college friends here to see what it was like to live here in Rochester for a little bit, with every intention of moving to Boston. I fell in love with Rochester and fell in love with this wonderful small town, but mid-sized city, with big city cultural attractions. I worked at an ad agency for three years, which prepped me perfectly for what I do here at the museum. So, when I came to the museum, I was the Public Relations Manager. My position has grown over the years of being here as the museum has grown. I also have to say that both Stacey and I, with our involvement with Visit Rochester, this was a great opportunity to learn about an industry that is a little bit more foreign to us. So we’ve both been learning a lot by working hand in hand with the Visitor Industry Council with museums, hotels, restaurants and convention services in areas that were new to us at the time and now are all great partners. I think that’s an interesting point because you’re a museum and cultural institution, right? And so, there’s a certain type of network that you have because of that. We mentioned several of the boards that you’re on, but also, you are so integral and so part of the tourism fabric of the region. To be able to have that Visitor Industry Council and Visit Rochester, as a partner and as a way to expand your knowledge and also your network – that is a great point. Eliza: Well, it’s unique to Rochester, and I think both of us have learned probably the most from sales missions. When you go on a sales mission, and you’re with other properties, with hotels, with other people in the hospitality industry, it’s a great opportunity to do that deep dive and learn about what we’re all doing and how we can work together. That’s awesome. So Stacey, can you tell us a little bit about your career path and your journey? Stacey: Well, as you can see from my bio, I started thinking I wanted to work with artifacts and art objects. I started off as a biochemistry major, but I’ve always been a hands-on kind of person. And I was working at the Met, and they said you need a graduate degree. I found RIT here in Rochester, which was an interesting experience. But in so doing, I met my future husband. And we had two kids together, and even though I tried to move back to New York City, I, like Eliza, had fallen in love with Rochester. It is such a creative community, one where you can get across town in 20 minutes, and all the things that I love are here. I love movies. I love gardening. I love objects. I love museums. I love the fact that I could afford to buy a house. So, I moved back to Rochester, and I’ve been here ever since. I am truly one of these people who love every aspect of our museum, whether it be the photography holding the motion pictures, the gardens, all the objects in the collection of camping gear, and firearms, and patents, and personal letters that my background in the museum prepped me for my current role, in that I sort of have touched at least five or ten thousand objects in our collection. So, when I go on the road to promote the museum and someone says, “Yeah, but do you know anything about this celebrity photographer?” “Oh yes, we’ve got at least 30 of those in the collection.” So, even though I’m not from marketing or PR as a background, I’ve gotten excited about certain objects I was able to handle, either for a conservation treatment or to put the accession numbers on, all of which I have done. I just love telling others about what a cool, awesome museum this is, and I think my enthusiasm comes through. Absolutely. That’s what makes marketing and sales so much easier. Because it’s not really like you’re pushing it, or that you’re even selling it. It’s not a hard sale for you. You’re just talking about the things that you love and sharing that with others, and I think that’s awesome. We’re going to dive right into these questions, and on this podcast, we focus on two areas: Creativity and collaboration. I know you’ll have a lot to share with us in both of those areas. I’ll start with you, Eliza, about the competitive nature of tourism and hospitality. There are so many choices of places people can visit in Rochester, across the country and even internationally. 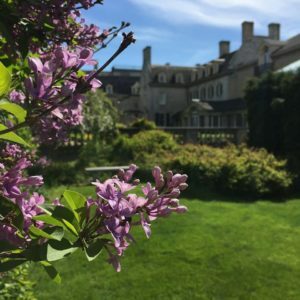 There’s just a lot of competition in travel and tourism right now, and I’m wondering what you have done to help the George Eastman Museum stand out from the crowd. Eliza: I know that we’ll get to collaboration, but interestingly, one thing that has allowed us to stand out, for Rochester to come across as strong as possible is for us all to work together. Even though we are very competitive, obviously, we all support each other. We find that working together is what makes us stronger. Throughout my years with the museum, whenever we’ve hosted people in town, whether it’s a tour operator or a travel writer, and they’re being hosted by a number of different people who all know about other aspects of the area. They comment about how unique that is, to have groups of us working so closely together. So from that broader perspective of how does Rochester stand out, I think that’s one of the things we do. As a museum, at one time, we sort of beat ourselves up for having so many different identities – not only George Eastman but also photography and film. We discovered that actually is our strongest asset; the fact that we are so many things that appeal to different people. So we try to play up the variety of things that we have, that we truly have something for anybody. Depending on the interest; photography, cinema, George Eastman himself, or decorative arts, architecture, history, gardens – it is all in one area. And because we’re in Rochester, people assume that we’re just a Rochester-centric organization, but we are truly an international institution. We’re one of the leading museums of photography and film. We are unique in that we can tell that complete story about photography or cinema, unlike any other museum. So we’re always thrilled when we hear that people have made a pilgrimage here, whether they’re coming from the east going west or vice versa. But they know that they want to get here because it’s on their bucket list because it’s their passion. Particularly for photography and cinema. That’s awesome. There’s nothing like being on somebody’s bucket list. That’s reaffirming, right? And you do have so many different things to offer. Not just the photography and the cinema, which you’re internationally known for, but the gardens and the history and the architecture and the art. So you do have a broad appeal. Stacey, I’m wondering if you have anything that you can add to this from your tour and travel perspective. Stacey: Yes, I’m learning as I go on sales missions and I go to these conferences that some motorcoach operators are bewildered by the various selections that we have at the museum. I personally am interested in photography, cinema, the mansion and the gardens, but I realize not everyone has equal passion for each area. So what I have done, and this has been helping me sell the museum a little better to tour operators and travel planners, is to say George Eastman’s motto for the Brownie camera: “You press the button, we do the rest.” I use that phrase to help tour planners plan their visits to the George Eastman Museum. You tell me what your group wants to see, and I will personally customize your visit so that your group or your individuals get the best possible experience when they’re here. I love how you’ve reused that motto and brought it into a modern application. That’s fun. And basically, what you’re saying is, you’re the expert. You told us when you talked about your journey a little bit; you have this passion. You’ve touched 10,000 objects, and so you really can help them customize those tours, and all they need to do is let you know what they’re interested in. You can do the rest. I think that’s a great way to leverage that. Stacey: I try to challenge everyone’s inner nerd, too. I encourage that. So, I say we can get geeky with you. If you want to get into inventions and cameras, I like to draw a parallel between the legacy of George Eastman and how he’s an early 20th-century version of Steve Jobs. Because, like Steve Jobs, George Eastman brought photography to the masses at the turn of the 19th into the 20th century. That’s a great parallel. And that’s a great way to do it, too, because you’re bringing that piece of history into something that’s relatable for modern times, and connecting those dots for people. Stacey: Yes, and explaining what film is; that’s always a challenge, too. I love that others have said that Steve Jobs and Bill Gates were the George Eastman of their time and that they were very influenced by George Eastman and what he did to try to make it as accessible as possible. That’s funny you mention that, because we were just going through some old pictures, family photos, and my 11-year-old pulled out some negatives and said, “Mom, what are these?” You have to explain that, don’t you? So this next question’s for Eliza. I find that creativity presents itself when we’re faced with a challenge or some kind of adversity, and I enjoy exploring that on this show. Eliza, I’m wondering if there is a time that you had faced a challenge with the organization, and what was the creative solution that came as a result of that? Eliza: Well, it’s interesting. I’d say ours is probably the biggest one. So in the 28 years that I’ve been here, for close to 25 of them we were George Eastman House, and we had various names. We were the International Museum of Photography at George Eastman House, and then we were just George Eastman House. And we always knew that the name was a limitation, but we never really fully addressed that. And two and a half years ago, thanks to our director, Bruce Barnes, we went through an extensive branding process where we looked at all aspects of the museum, including the name. We determined that our name should be, and is now, two and a half years later, George Eastman Museum. 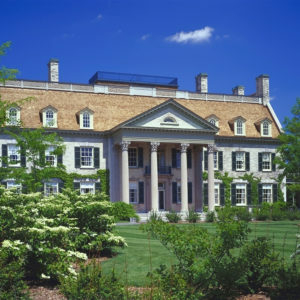 This was significant for us, because I know, whether it was in the tourism industry or the museum industry, when you said George Eastman House, unless you had the benefit of millions of dollars in an advertising budget or being an organization like the Met or MoMA, people would just assume you’re a historic house. Because George Eastman was such a private person and didn’t want his name known, he put all of his muscle behind Kodak as a brand; we’d come across more and more people confused about what the museum even was. And so I’m thrilled that we did make that change. There has been a tremendous response as far as people understanding now all that the museum is. It allows us to use that umbrella for all the entities that we are as a museum. Can you share with us a little bit about how that branding process worked? Because I’m sure, it wasn’t something that happened overnight, right? I’m sure there were certain steps and stages that you went through. Eliza: It all starts with a survey asking extensively for feedback on the museum. One of the most helpful exercises we did was to examine the adjectives and nouns people use to describe the museum. You look at what adjectives people are using and what nouns they are using. The consultant we worked with noted that of every organization, he’s ever worked with, the most number of nouns were used to describe the George Eastman Museum. Meaning, a museum, a house, an institute, a center – people had differing perceptions of what we are. So, that was significant. Also, as part of that, we talk about what the various personality traits the institution exhibits. These traits can be thought of as living the brand. Whether it’s from the guest services team that’s greeting you, to our website, to collateral material, to the programs we do, the kinds of exhibitions we do – all these support that personality. And then you have a grand promise, which is not anything that ever appears in print. What is it that we stand by that is a promise to all of our audiences? And then making sure that we deliver on that. Eliza: So, it’s a wonderful process to go through. At the end of it, you have a brand platform that is important to share with any new staff members that come on board, so that they understand what the core of the institution is. The challenge is to make sure you keep it front and center so that it is something that we’re consistently asking ourselves. Are we living our brand? It’s not something where you just clap your hands and say, “Okay, we’re branded. Put it in a folder, and we’re done.” It needs to always be at the forefront of everything that we do. I think, what a tremendous opportunity, too, for the organization to have gone through that process and now to have such a clear vision of exactly how you live that brand. I love that you talked about, the personality of the brand and how you have your brand promise and now how you have these materials that you can use when you even onboard new staff so that you can stay true to that. I think that that’s just tremendous and important for achieving what you’re trying to do. Stacey: I’ve met with some motorcoach operators who say museums don’t sell. So if they still want to refer to us as George Eastman House, I just let that one slide. Because there is still the house. There is still George Eastman’s house, the mansion, so it’s not inaccurate, it’s just part of a bigger entity. So, however, it works best. That’s a good point because there are these perceptions about the word “museum” as to exactly what that experience is going to be. But I know that the perceptions are probably behind a little bit. But what a museum is today is much different than what it was before. It’s not just this gallery that you just walk around and look. It’s much more interactive and in-depth than that. Stacey: Right. I’m always telling people about experiences that they can have here at the museum in addition to their tour. If they want a tour of the mansion, or of the galleries or the gardens, that’s great. But I always tell them there are ways that you can enhance your visit to create more of a hands-on experience for your visitors. So, they can come and learn how to divide a perennial with one of our garden staff, learn how to print a photograph from the 19th century with our photography workshop staff. And because George Eastman was such a great outdoorsman and hunter, he prepared all his food here before he went off on safari or on a hunting trip. So one of his favorite recipes that he made was his famous lemon pie. So I always say to people, you can go to the café and watch the staff prepare George Eastman’s famous lemon pie, and then everyone can enjoy a piece. So it’s kind of like a cooking show interaction, in a way. And people are always intrigued by that. They rarely book it, but they just enjoy the idea that they can enhance their group tour with a hands-on experience. Yeah, that’s great. Switching gears a bit, looking into the future, is there a project that you are excited about in the coming months, or years? Stacey: Yes, there is. We are going to be getting a new entrance to the museum. I don’t know if you’ve ever visited the George Eastman Museum recently, Nicole, but we make people walk about a quarter-mile from the parking lot around the side of the museum from University Avenue, and now we’re going to get a brand-new entrance that is right from the parking lot. Whether you’re pushing a stroller or a walker, or just walking in, you’ll enter through this beautiful greenhouse atrium and come up to the visitor’s desk, and right there will be the café and the gift shop and the restrooms, and the Dryden Theater, and then the galleries will be to the north on the left-hand side, and then you can go to the mansion on the right-hand side. I think this will be an incredible enhancement to the visitor experience at the museum, and I can’t wait for construction to begin in January. That’s awesome. And yes, I have been to the museum, and I do know the challenges with your current entrance and where guests have to walk. That’s a fantastic project, and I look forward to seeing that come to fruition. Eliza, do you have anything else to add to that? Eliza: Well, the whole intention is to make it much more accessible. As part of that will be a new café that will be slightly bigger and will also include a garden room option for seating. We have George Eastman’s Palm House, which is where he would have brought many of his plants in during the winter months. Now it is a very comfortable space in which to sit. We’ll have that as an opportunity for the café. People can go in and sit in that garden room and overlook George Eastman’s beautiful terraced gardens. So, we’re thrilled about that. There will be a new store, as well. So, it’s just going be a whole new facelift for us, which is very much needed. It will put forth the first impression that we want to give that we haven’t been giving so far. I hope this next question doesn’t throw you off, but I’m wondering how you’re living that brand promise, even with this particular project. I’m sure you must have taken that into account as you were planning for it. Eliza: Absolutely. It’s an opportunity for us to think about all the various stories that we tell and how to make sure that we welcome people properly, orient them properly, so that, as Stacey mentioned, we’ll come to a crossroads where you can choose to start your tour, start your visit either to the north with the galleries and more of the collection, or to the south and the story of George Eastman. And so, then, it’s on us to really make sure they understand what are these stories, how do these stories intermingle, to get people excited and have them torn about, “Oh no, which way do I go, because I want to see both.” It will be an opportunity for them to have this full, rich experience, regardless of which way they decide to start their visit. That’s fantastic. So we’ve already talked about this a little bit, but I wanted to dive in a little deeper into the topic of collaboration. You touched on this earlier, too, Eliza. It’s this whole idea of what I like to call ‘coopetition,’ where perceived competitors come together to create bigger wins than what they can do on their own. You described it a little bit earlier when you talked about how you position the community, Rochester, as a community, to the traveling public. I’m wondering if you can elaborate a little bit more on a time when a collaboration between competitors has worked for you. Eliza: Sure, and I love the term, ‘coopetition.’ I would say that’s something that is consistent in all the marketing that we do that has to do with tourism. Not surprisingly, as a non-profit, we have very limited dollars. And so, any time we can partner with others, whether it’s through Visit Rochester or Finger Lakes Tourism Alliance, or I Love NY, to be able to have our dollars go further to reach a Canadian audience or the Chinese audience, or any group there’s no way we would have the dollars to really effectively reach. So that is, through and through, something we always do. This whole idea of collaborating with other cultural institutions in the community actually started about 10 or 15 years ago. We had a collaboration titled Legacies and Landmarks, where we partnered with Genesee Country Village and Museum just south of Rochester, the Susan B. Anthony House here in Rochester, and also the Women’s Hall of Fame in Seneca Falls. It was something that we had received a grant for, and it allowed us to pool our resources to come up with itineraries that involved all four of us, based on themes that we shared, as well as hire somebody to represent us. And while it was not a collaboration that lived much beyond the grant, it didn’t necessarily intend to. It was an opportunity for us to become much more knowledgeable about the field, and to really dip our toe in the water, as far as more exposure for all four institutions. So, that was incredibly successful. As a result of that, more recently, we were having the same conversations. And Stacey can share more because she lives and breathes this, but in talking with the Strong National Museum of Play here in Rochester, and again, Genesee Country Village and Museum, our three institutions are most passionate about tourists. We’re the ones that are suited very well for tourists in Rochester, and so we decided to again collaborate and pool our resources so that we are helping represent each other, whether it’s going to trade shows or sales missions involving collateral materials and that kind of thing. We couldn’t do it without our partners. We really couldn’t. Stacey: Absolutely not. I travel quite frequently with my counterparts from the Strong and the Genesee Country Village, and we believe that a rising tide lifts all boats. We may be competitors to a degree, but really, each of our institutions is so different. George Eastman’s birthplace is located in the Genesee Country Village. Margaret Woodbury Strong would have never have gotten her millions if her parents hadn’t invested in the early days of the Eastman Kodak Company. So in a way, we’re all related. The tie that binds us all is George Eastman. But to travel with these amazingly talented women is wonderful. And especially my colleague Karen Dodson at the Strong has a background in hotels, so she understands what hotels need from a tourism perspective. So I learn a lot from my colleagues. We feed off of each other. If a customer says, “Well, I’m really looking for something like this,” one of us will recommend the other institution. But basically, what we want people to do is not just come to Rochester on their way to Niagara Falls or on their way to New York City. We want them to come and dwell in Rochester so that we can show them what an amazing city this is, beyond just cultural institutions, but also our amazing farm-to-table restaurants, and the canal and the experience you can have there. We are close to nature and the Finger Lakes and all the wineries. It’s great to travel with these women and promote the area. None of this would be possible to do without Visit Rochester helping, getting us together on the same committee, sending is out on subsidized sales missions, so it does help promote the area collaboratively and cooperatively. That’s great. Those are perfect examples of what can be achieved when you collaborate. I’m wondering, Stacey, since you just gave us those examples of those partners that you’ve been working with, the Strong and Genesee Country Village and Museum, how have you found those partnerships? Primarily, it sounds like through Visit Rochester. Do you have any advice for our listeners who might be looking for partners and wanting to partner in that kind of a way? Stacey: Yes, I would say if people from cultural institutions want to get to know their counterpart at the collaborating places, you can do a sales mission. For a three-day sales mission, we’ve done it for about; I’d say around $400 per person. So, you can pool your resources, regarding car rental and where you stay. Maybe you have some hotel partners that can give you a friend and family rate at a hotel in the region where you want to make sales calls. Look at your past visitors and see if there is anybody who has been there in the last ten years. Give them a call in a given region, make an appointment and try to see if you can schedule seven or eight appointments on a given day by geographic region. It takes some planning, and you might want to see if you can hire a consultant to help you if you have the budget. But if you don’t have the budget, sometimes by just sharing the knowledge with the same people sitting at the table from your region, you can come up with a good list and bring a little gift from your various shops. People are very happy when you come to see them in their environment. You tell them about your region, and each individual talks about their attraction and what they have to offer for group tours – that’s a sales mission. It’s a wonderful thing. That’s great, and I’m sure there’s a lot of learning. You mentioned learning. You could probably sell each other’s attraction, you’ve heard each other’s pitch so many times, right? Stacey: We have, and sometimes it can send us into fits of giggles. Sometimes late in the day, you get a little bleary-eyed and someone will jump in and finish your sentence for you. It’s wonderful to have each other’s back and be able to do that. I can say I truly enjoy my colleagues at other institutions. I love going on the road with them, because we have the best time, and I think our enthusiasm reflects well on our area because we do get quite a few bookings from missions. That’s great. And Eliza, where have you looked for and found great partnerships? You mentioned the Legacies and Landmarks and a few other examples. How did you go about pulling those together? Eliza: Well, I think with any partnership, it’s about understanding each other’s goals and looking for organizations that have similar goals for whatever the project is. Whether it’s a particular audience that you want to reach if it’s a time of year where you’re looking to draw more people. A few we’ve done consistently. With the Memorial Art Gallery at the University of Rochester here in Rochester, we were finding that they had lower attendance during the summer months. That’s one of our peak times. For many years now, we’ve been collaborating on something called, “Get Cool, Get Cultured,” which is during July and August, where if you visit one of the institutions, you get a pass from the other one for a buy one, get one and vice versa. So it’s a great way to cross-pollinate. It is similar with Sonnenberg Gardens. We have gardens. We can look at other partners that have gardens where we might be able to do a package. Whether it’s hotels, looking at the Strathallan Hotel, just down the street from us, or other hotels in the region, where there’s an opportunity to do packaging. So, it comes down to what our particular goals are and finding someone who has a like goal. But we also do it from exhibition to exhibition. The exhibition that we have coming up this summer of works by David Levinthal, who uses figurines and toys in dioramas to recreate aspects of history, or westerns or baseball, or hockey. For that, we’ve partnered with Strong Museum, and with the National Baseball Hall of Fame. So, in everything we do, we try to look at where somebody has a similar interest and a similar passion for what we’re doing, and how can we help reinforce what each other is doing and cross-promote. I think those are great examples and also really good advice. So, you’re thinking outside of the box and looking at all different aspects of your organization. Stacey talked about tour and travel and building itineraries and going on sales missions, but then you’re talking about looking at your exhibitions and where you can tie in, or looking at the gardens. I love the Memorial Art Gallery example with that “Get Cool, Get Cultured” buy one, get one, and just looking at the seasonality of each other’s organizations. So many different ways to think about it. Eliza, I know that when you’re working in a partnership, managing expectations is just critical. I’m wondering how you set the groundwork for a successful partnership. Eliza: Well, I think it is just exactly what you said, which is understanding what the expectations are. And thinking back to Legacies and Landmarks, which, because it was part of a grant, it was imperative that we each took on a role and knew what those roles were and that we were accountable for those roles. So, for instance, in that particular partnership, we were the fiduciary partner. Another partner was the PR partner. Another was the marketing and print material partner. Another one developed the itineraries. And so, it’s important to have very clearly spelled out at the beginning what each partner is bringing to the table. It’s knowing the organization that you’re working with and having trust in them that they’re going follow through. We’ve been very fortunate in that area. I don’t really know of a bad partnership that we’ve had. But if there were any negatives, it was probably just that we didn’t clearly state exactly what the expectations were of those involved. I think that’s great advice. I like how you talked about understanding the expectation and knowing the roles of each of the partners, but then also that accountability piece is so important. And Stacey, how would you describe what you look for in a great partner? Stacey: I look for somebody who has enthusiasm and knowledge about whatever it is that they have, whether it be a great hotel, unique hotel property that we have here, like my colleagues at the Woodcliff Hotel. Also, even the public market. I’ve been talking to the person who manages our public market and how we can bring motor coach tours there to forage for lunch. There are lots of booths and stalls that sell locally made produce you can buy from the farmer. And it’s such a neat downtown feature here that I don’t think many people get to know that. I like to try to tie that into George Eastman’s urban farm that he had here on the 10-acre estate. So I guess what’s great about the multi-faceted aspect of the George Eastman Museum helps us find partners in unexpected places. It’s terrific. But there’s a lot of great people who work in the community here, and again, I think the great connector is our CVB, is Visit Rochester. I meet these people in our larger group, our industry council meetings once a month, and I may say something that will spark a conversation or if they say something. We’ve been working a lot with trying to tie our school group tourism into our celebration of the 200th anniversary of the birth of Frederick Douglass, who lived here for many years and published the North Star. The Underground Railroad is a whole new aspect of tourism here, and you think, “Well, what does Frederick Douglass have to do with George Eastman?” Well, they overlapped, and George Eastman was a huge supporter of African American universities in the country. He was personal friends with Booker T. Washington. And so we try to tie the whole region in. There’s a need to try to make kids excited about history, and we can work with small historical groups here in town, or just people who give walking tours, and try to make it all work together. I think that reinforces what I said at the beginning of our conversation, which is where we recognize now that being so multi-faceted is such an asset for us, because you could bring up any theme. And particularly in the area of photography or cinema, we can find a connection, because those very important mediums tell so many stories so that we can connect any theme. And then, very likely, too, there’s some connection to George Eastman. So it’s become a huge bonus for us. I love how we come full-circle in these conversations, which is always lots of fun. I knew this would be a great conversation with both of you, and I appreciate you spending some time with us. Before we say goodbye, do either of you have any final words you would like to share? Eliza: I guess I would say I loved Stacey’s advice about people looking around in their community and seeing who can they partner with and don’t think of necessarily the most obvious ones. Think back to those first questions about creativity. Try to think creatively about the less expected partnership, have a conversation with someone, and I bet you’ll find a common thread that could be an exciting partnership going forward. Stacey: And that it might not be so overwhelming, say, for a smaller historical society, or a community group to present, say, a tour. For instance, we have these amazing tours of the Mount Hope Cemetery where Susan B. Anthony and Frederick Douglass are buried. They were overwhelmed with how to reach out beyond the community to get people excited about their tours. We just met with them, the Friends of Mount Hope Cemetery. I got a handle on how they give their tours, and then when I’m out on the road, I tell people what more appropriate way to end your Underground Railroad tour than to visit Frederick Douglass’ grave site? So it’s a wonderful thing. But just getting out in the community and knowing your neighbors, right? I agree. I wrote that down, too, Stacey, about finding partners in unexpected places. I thought that was a great point and I appreciate both of you sharing all of your knowledge with us and our listeners today. And we will look forward to checking back with you at some point in the future. Eliza: Thank you so much! Stacey: Great to be with you. Thank you.